This is the very definition of "dangerous incitement," and a number of journalists, observers and critics pointed that out Thursday morning when the cover came out. 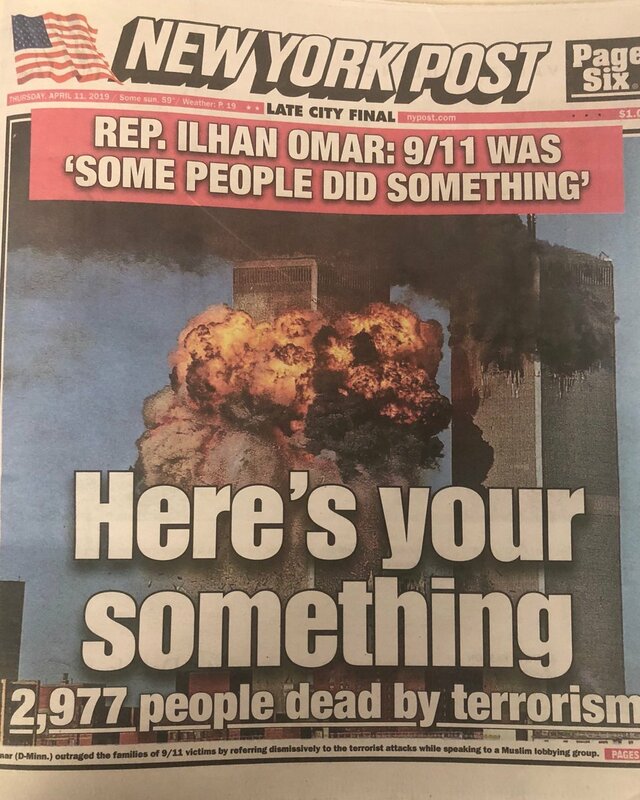 In response to remarks Rep. Ilhan Omar (D-MN) made about the aftereffect of 9/11 at a Council of American-Islamic Relations banquet that has been met with over-the-top conservative backlash, the New York Post poured gasoline on that fire with an extremely provocative cover photo showing the World Trade Center explosion. Just to recap, Omar delivered a 20-minute speech at a CAIR event last month, a week after a white supremacist gunman killed 50 Muslims in New Zealand. The Democratic lawmaker took the opportunity to call for Muslim activism in the face of growing Islamophobic violence before noting that Muslims were relegated to second-class citizenship following the 9/11 attacks. This was followed by Fox & Friends host Brian Kilmeade openly wondering whether Omar considers herself an “American first,” comments he attempted to walk back on Wednesday afternoon. While one would have hoped that this made-up controversy would die down, especially since it is obvious that there was a bad-faith and willful misreading of her comments, the New York Post — owned by Fox News owner Rupert Murdoch — brought us back to reality. This is the very definition of “dangerous incitement,” and a number of journalists, observers and critics pointed that out Thursday morning when the cover came out. The New York Post, Fox News, Sinclair … these are just massive propaganda outlets for conservatives to foment bigotry and spread partisan talking points. There is just nothing comparable on the left.